Yoga of Perfection brings the Gita to us in a way as never before. Choice Sanskrit verses are translated word for-word, and them elaborated upon with the clarity and lucidness only an enlightened personality could offer. In “The Essence of the Gita. “we get an accurate account of a hero’struggle, his conflicts and Krishna’s liberating teachings, what’s more since the Gita is the original scripture promoting an Integral path of Yoga. All in all, Yoga of Perfection holds out a fortune of wisdom, uniqucly presented. Exquisitely detailed and matchless in practical value. 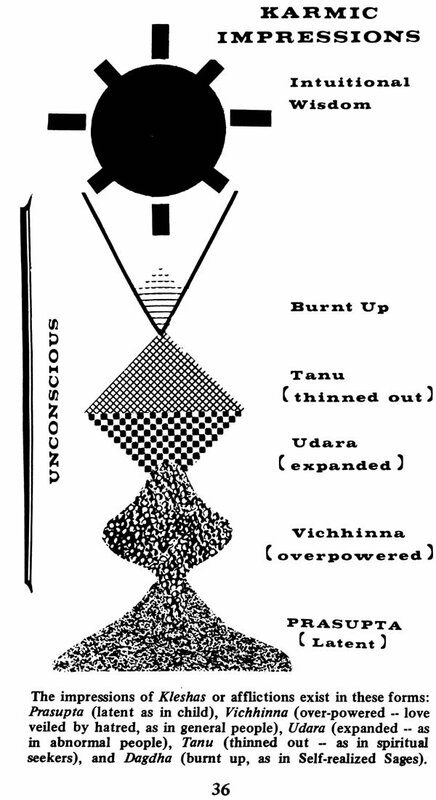 There is no scripture in the world as profound, practical and lucid as the Bhagavad Gila. It is one of the most sacred religious works of the Hindus. And yet, it is not confined to the realm of the Hindu Faith alone. It is universal in its exposition of man's religious movement towards God. Great men all over the world have derived immense inspiration from this great teaching. 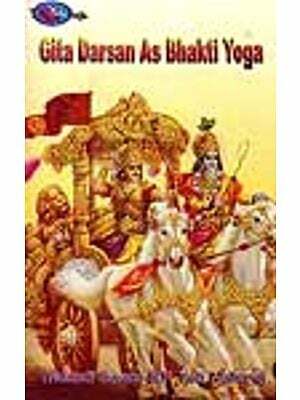 The Gita is a portion from the great epic work "Mahabharata" composed by Sage Vyasa many centuries before Christ. The term Gita means "Song". The teachings of the Gita are presented in most elegant Sanskrit verses which are recited and sung in melodious notes. Apart from its unique literary beauty, the Gita turns the confusion of the mind into a song of spiritual devotion; therefore, it is befittingly called "The Song". The Hindus add reverential terms to glorify the Gita, calling the great scripture 'Srimad Bhagavad Gila' implying "The Song of Supreme Divinity". As a text of Yoga philosophy, the Gita is one of the three main pillars of Yogic Wisdom. These three pillars are: The Upanishads (The end of the Vedas), The Brahma Sutras (The Aphorisms of Vedanta Philosophy), and The Srimad Bhagavad Gila. All great teachers of India commence their teachings by presenting their commentaries on these three great texts, of which the Gita is the crest-jewel. Over centuries there are numerous traditional commentaries written on the Gita by great Acharyas and Sages of India. The Gita has thus acquired a vast literature rich with spiritual insight and wisdom. The Gita presents a dynamic picture of spiritual life. It does not advocate a passive withdrawal from the world in search of spiritual peace and perfection; rather, it beckons the soul of man to fight the battle of life heroically and attain victory in the form of Self- realization. A great warrior of antiquity, Arjuna was confounded and confused in the midst of two contending armies. Divine Krishna who was acting as his charioteer gave his sublime teachings to grief-strickenArjuna. However, these teachings became universal in their implications. The very setting of the Gita presents a symbolic picture of life's incessant battle. The soul must face the contending forces of darkness and light in the battlefield of life. Being guided by the intuitive vision represented by the Divine Krishna, the soul is led to join with the forces of light in order to destroy the forces of darkness or evil. Whoever discovers the real value of the Gita will dive deep into the ocean offullness and bliss. The great Mahatma Gandhi once said to the members of his Ashrama, "I run to my Mother Gita whenever I find myself in difficulties, and up to now she has never failed to comfort me." Yogic aspirants reverence the Gita as the very embodiment of Divine Mother. It is important for an aspirant to gain an insight into the teachings of the Gita, in order to live a life that flows on to the Ideal of Yogic Perfection. Our beloved Guru, Sage Swami Jyotir Maya Nanda has given the essence of the teachings of the Gita in a style that is simple and yet profound. Endowed with the intuitive knowledge of the Self, he has an exceptional ability to reach out to the hearts of his readers and to awaken in them a profound understanding of the sublime teachings of the Gita and their subtle implications. In the light of this present work by the Author, Sage Swami Jyotir Maya Nanda, a perfected personality must be a blend of selfless action, supreme devotion, profound meditation, and illuminating wisdom. He must have a reason that shines with the light of transcendental wisdom, a will that is indominable in controlling the movements of the mind, a devotion that loves the Self behind the illusion of all names and forms, and a practical life that is devoted to the welfare of all. A perfected Yogi is called a Sthita Prajna because his intellect is ever established in the vision of the transcendental Self. 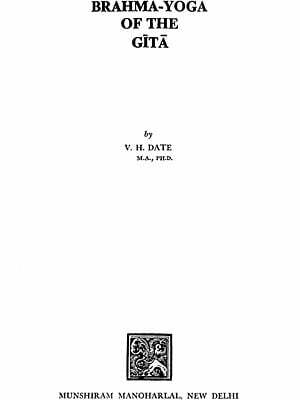 The brilliance of his intellect cannot be marred by the transient developments of the day to day world, may it be pleasant or painful, bitter or sweet. He is also called a Bhaktiman=true devotee of God, because, he attains the fulfillment of his sentiments by discovering God as the basis of all that is loved. He is further called a Trigunateeta, a Yogi who has transcended the three Gunas- the three modes of nature. Though living in a world of changes, he continues to hold his vision in the immutable domain of the Non- dual Self. The Gita is a profound scripture containing the essence of life and its mysteries, its hidden potentialities, the manner of unfolding them, and the luminous path that leads to the highest Goal whence there is no return to the world of duality and repeated births and deaths. It reads like music, not merely the music that fills our ears with sweet sounds, but the music of the soul which fills our heart with the sense of eternity and immortality, which floods our inner beings with light and bliss. The Gita opens with a conflicting situation in life, a situation in which one is confused regarding one's duty, a confusion in which the best of talents and heroism seems to be drowned in grief, the best of intelligence seems to be blunted. This is inevitable in the life that tends to attain the blessedness of Nirvana, the experience of Liberation. It is under such conditions that all human efforts fail to calm the agitations of the heart, and all human intelligence and skill remain stupefied, with a sense of surrender to a higher being, to a higher voice, that the greatest teaching is revealed to the soul from the Lord of all souls, the Supreme Being, the Divine Krishna. The first chapter presents this situation in the life of the hero, Arjuna. Esoteric significance can be very easily understood by the reflective aspirants. This confusion of Arjuna is symbolic of such confusion in the battle of life. It is true to one and all. None can emerge victorious in the battle of life, unless he has tasted such conditions that shake his egoistic vision from its very foundations. Whatever may be the external shape of one's duty, the vision that should sustain our efforts is the same. Whatever may be the role that we may have to play in this world, the knowledge of the roots of our beings is the same. 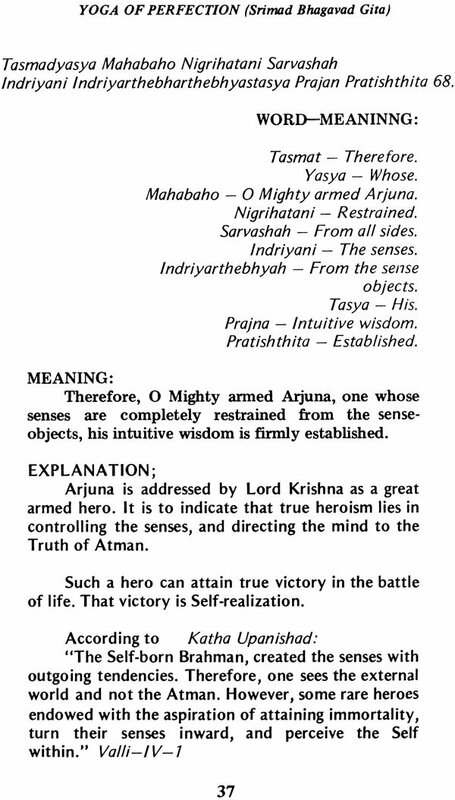 Lord Krishna calls Arjuna to duty by awakening in him the knowledge of the Self. Even so, humanity is called to duty through the message of the knowledge of Self. Knowledge of Self is the fountain of all culture, civilization, sublime works, and all that is abiding, all that is truly auspicious and beautiful, in this world of names and forms. Arjuna is led step by step, on the ladder of Yoga, to the blessed revelation of the purpose of life, to the final attainment of Liberation. 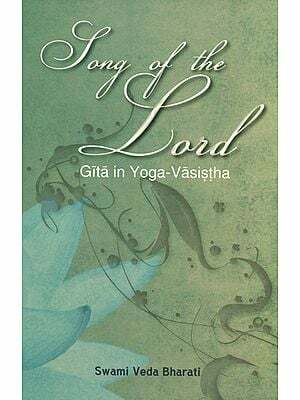 The eighteen chapters of the Gita reveal the spiritual journey of the soul with its mysterious manifestations, thrilling revelations, wondrous experiences, and awe-inspiring visions. The various sights and scenes, the various colors of the mystic path are beautifully described, and there is no traveller on the path of life, who will not find deep wells of wisdom through the Gita to quench his insatiable thirst after the illusory joys of the world. There is no pilgrim on the path who will not breathe a sigh of relief under the cool bowers of the teachings of the Lord. There is none in the world for whom Gita has no message, for whom Gita is not a fountain of inspiration and strength.